Back in the 80’s I was not much into all the ninja stuff presented in the media. I am aware that there were several ninja movies and that some of the more popular videogames in the arcades had ninja in them, but for the most part I wasn’t all that impressed by the idea of pajama-clad samurai. However, about the time Star Wars toys went away I came into possession of almost a complete run of the G.I. Joe comics published in Spanish by Editorial Novaro, and by the time I finished reading them I was pretty much enthralled by the fictional story of the Arashikage line and their ties with the G.I. Joe organization. With that in mind, it should come as no surprise that one of my favorite G.I. 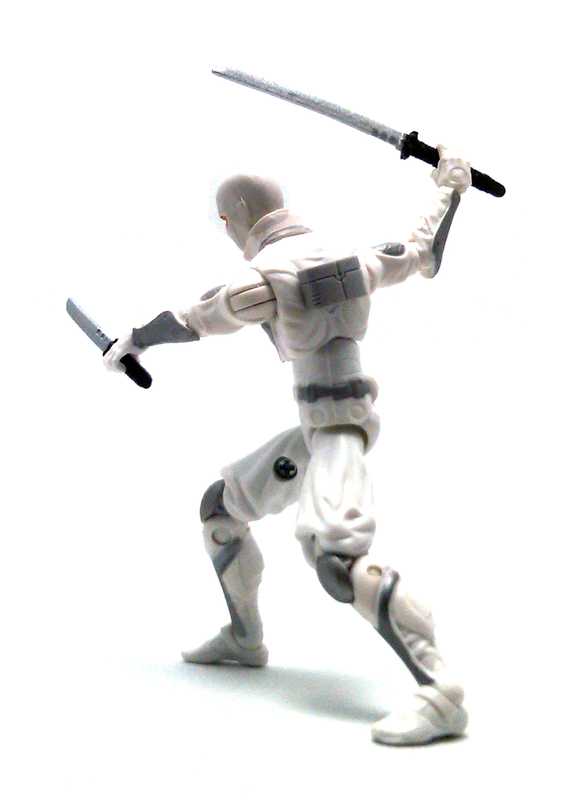 Joe characters is precisely the subject of today’s review, Storm Shadow. 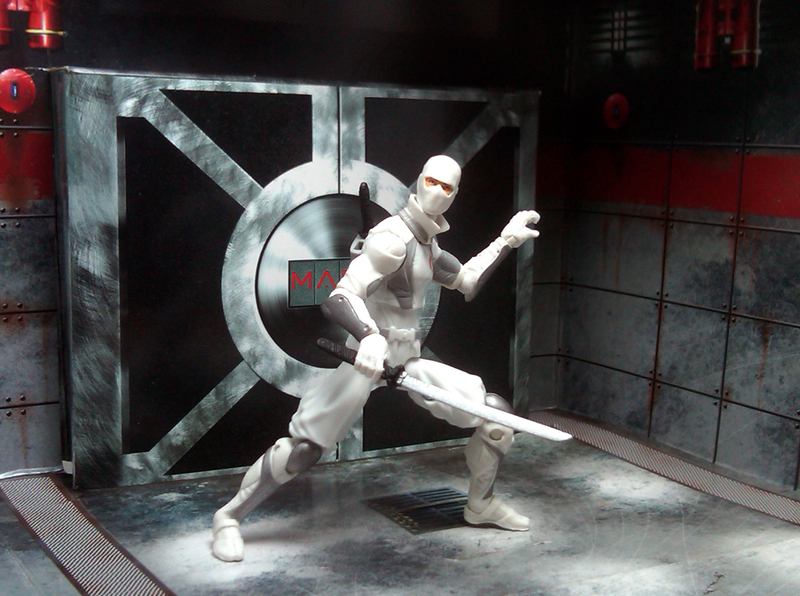 Although I may not agree entirely with the way Storm Shadow has been portrayed thus far in the movie universe, I am certainly happy that we get new Hasbro toys, even if they are not quite movie accurate, which seems to be the case with this first wave of figures. 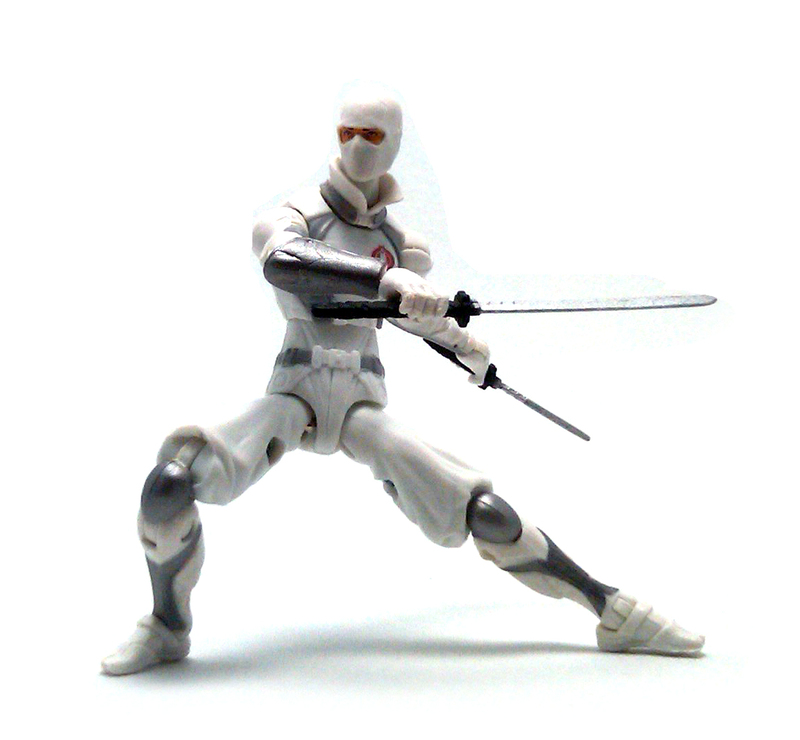 This version of Storm Shadow comes decked in a white, futuristic-looking outfit that really brings to mind the attire worn by the ninja in the old Shinobi videogame. The simulated cloth sections look loose and puffy, while still providing a stealthy outline. 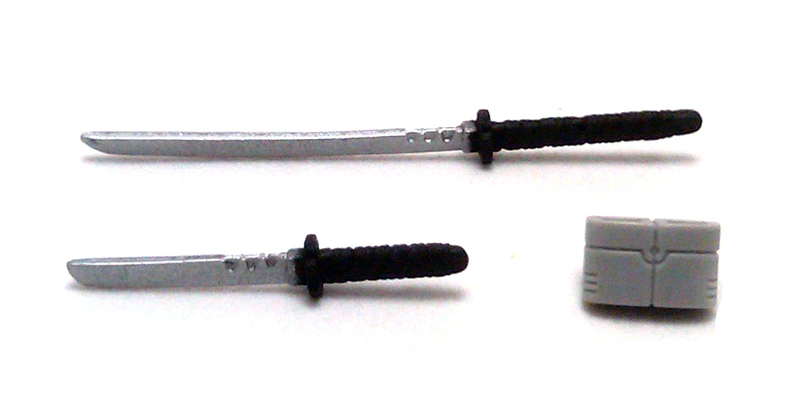 Unlike most of the gun-toting characters in this line, Storm Shadow’s wrists bend up and down on both sides, instead of having the hinge on the left hand going in and out. I think this approach works just fine for characters that rely mostly on blades. 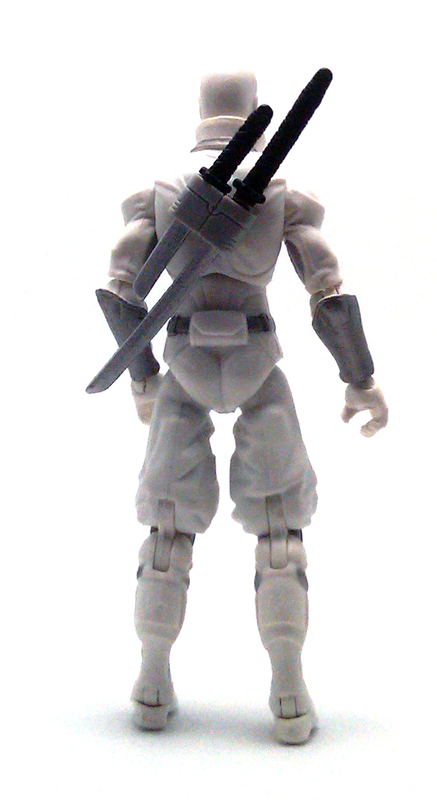 Storm shadow is molded entirely in white plastic, with only a few areas of paint applied to the uniform and the head. The eye paintjob is very neatly applied, as is the red cobra crest painted over his left breast. This year, Hasbro continues including the spring loaded launchers with their figures, but also adding some zip lines and the like to capitalize on one of the highlight scenes from the movie trailer where we see ninja battling it out on a mountains side. 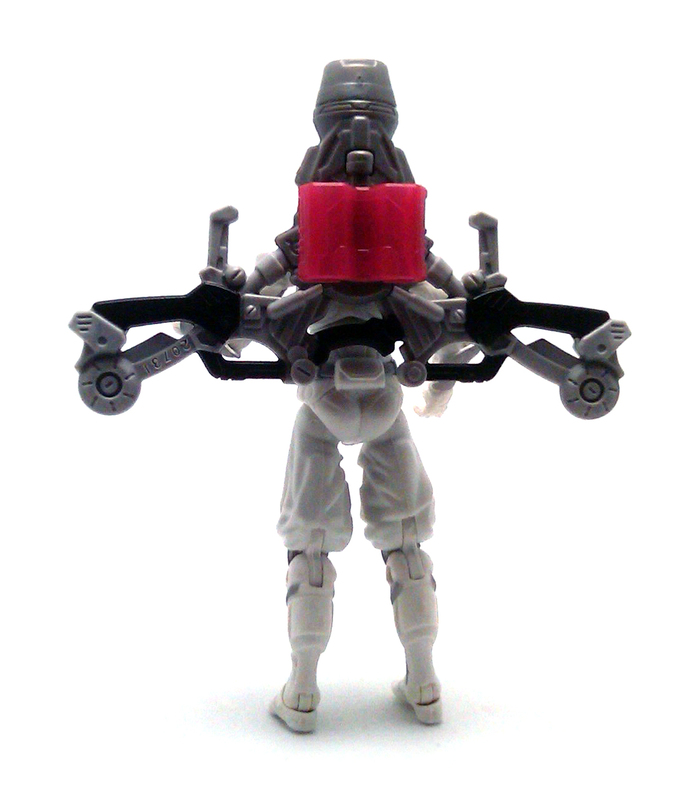 Storm Shadow’s launcher is a giant backpack roughly shaped like a bow that has some plastic loops to run the included zip-line through. The cord goes through a loop on the provided projectile and has a plastic clip at each end. At this point I will not pass judgment on whether or not these features are fun or not, all I will say is that the whole contraption seems to be over-engineered and that I would rather have more regular weapons instead. 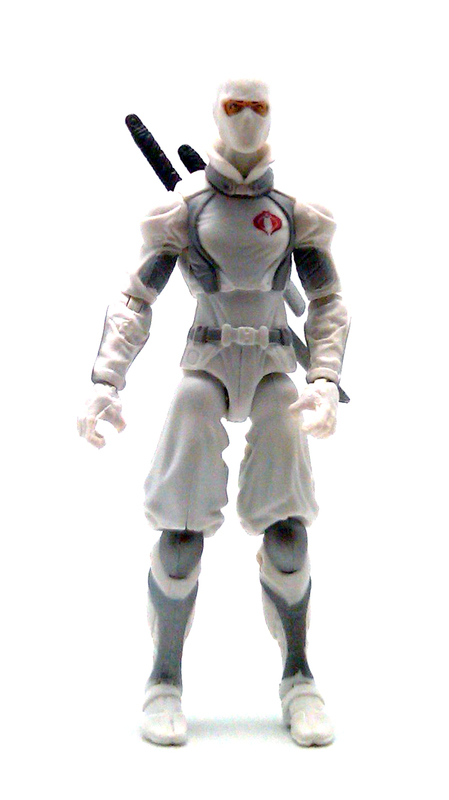 Overall, I really liked this version of Storm Shadow. It may not have all the nifty extras I’m used to from the previous G.I. Joe lines, but I think it is an all around solid figure.